The name of the city: Győr megyei jogú város means Győr city with County Rank The pictures made by me from the office of Győr city. Győr is located in the territory of Győr-Moson-Sopron County but it is not a part of the county. The flag was adopted in 1990. I located a site: <www.different.hu> with two flags for the town of Győr. This is a memorial flag. The front side of the flag is same as the official Győr flag. the back side is a script: "A GYORI TUZOLTÓSÁGNAK 1870-1990 ADOMÁNYOZTA GYOR VÁROSA" means "FOR THE FIRE-BRIGADE OF GYOR 1870-1990 PRESENTED BY THE TOWN OF GYOR"
The Previous Flags are correct versions of the flag based on the No.6/1998 (III.1.) Resolution. 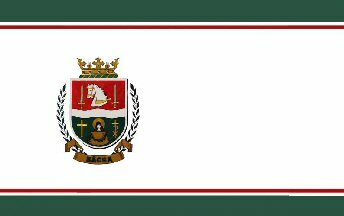 The flag is 150x120 cms, the Coat of Arms is 60 cm high. Ratio of the horizontal flag: 5:4, the vertical flag: 4:5. No.2/1974 (TK.2/1974) 'communist-era (1974 - 1989 flag). The dimensions of the flag were removed from the text of the regulation, and this flag is used now in 2:3 and 1:2 ratio, as well. Regulations on the Coat of Arms and flag of town (in Hungarian) at <jogtar.gyor.eu>. Photo of the flag here. Description of Coat of Arms and some basic information (in English) at <www.nemzetijelkepek.hu>. This flag appears at Dr. Széll Sándor: Városaink neve, címere és lobogója (1941) as "Győr, Győr-Moson and Pozsony Co.". Győr didn't adopt the historical Flag but uses today the same colors (blue-red-white) which came probably from the Coat of Arms. The historical flag looks like banner of arms, so the question is did Győr had another Coat of Arms in those days ? No. Győr Coat of Arms is the same as in the book. The book shows the Coat of Arms too. Vertical diband: the hoist half blue with a white cross throughout (width = 1/7th of the hoist); the fly half seven red and white horizontal stripes (the middle of which coincides with the horizontal arm of the hoist side cross). Note the differences in the background (blue v. white) type (vertical v. horizontal) and the different Coat of Arms between this flag and the current one. Győr city - "In the Coat of Arms of the city on the right side of the divided fields there is the old castle relates to the historical past, the three white stripes relate to the Danube, the Rába and the Rábca Rivers. On the left side there are a cog-wheel and a hammer relate to the industry of the city, the pen relates to the cultural traditions." image by eljko Heimer, 8 January 1999. 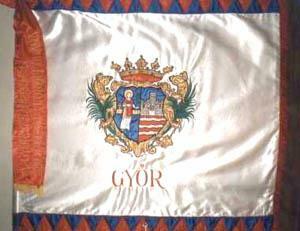 The flag of Győr was reported on Dirk's Flag Collection by Dirk Schönberger that was hosted by CESI back then - it was simple white flag in ratio 2:3, with Coat of Arms in the middle and underneath the name of the city. If I remember rightly, the flag I reported was seen by me in some TV report from Győr, several years ago. It may be that the flag with the coloured edges was not officialized back then, or that it was the "less ceremonial" flag that was hoisted - or that I simply failed to notice the borders on the quick glance on the TV. In any case, the edged flag looks much better, and is much more in tradition of the Hungarian flags. The flag without blue and red triangles on the edges is wrong and not official. Bácsa is the nort-east part of Gyor city north to the Mosoni Danube River. Old homepage of the settlements (Bácsa, Kisbácsa) at <www.freewebs.com/bacsa>. I located an photo of flag in <www.barossg-gyor.sulinet.hu> .Isn't it the city Coat of Arms on the flag ? From what I can understand, this is the flag of a school in Győr. It is indeed the city Coat of Arms or, at least, it seems that the city Coat of Arms is part of the school emblem. Compare it with the flag of Győr above.